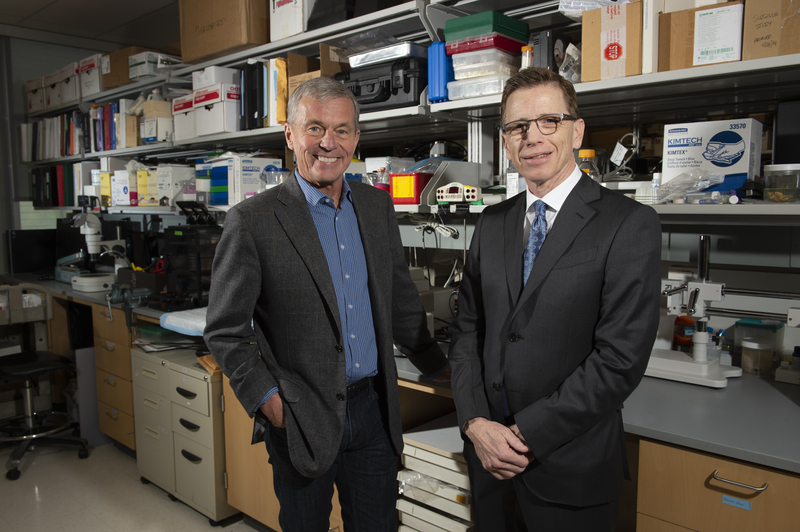 Stephen Badylak, left, with Paul Fagan, CEO of ECM Therapeutics Inc., the startup formed from numerous patents developed in Badylak’s lab at Pitt’s McGowan Institute for Regenerative Medicine. Stephen Badylak’s unorthodox path to medicine always sought to combine the benchtop and the bedside. After treating patients for 16 years, he moved exclusively to the lab when he joined the University of Pittsburgh in 2003. Since then, his discoveries have improved the lives of millions of people and are poised to impact millions more. Badylak started his career as a veterinarian, but quickly went back to school to get a master’s and a PhD in clinical and anatomic pathology before pursuing his medical degree. 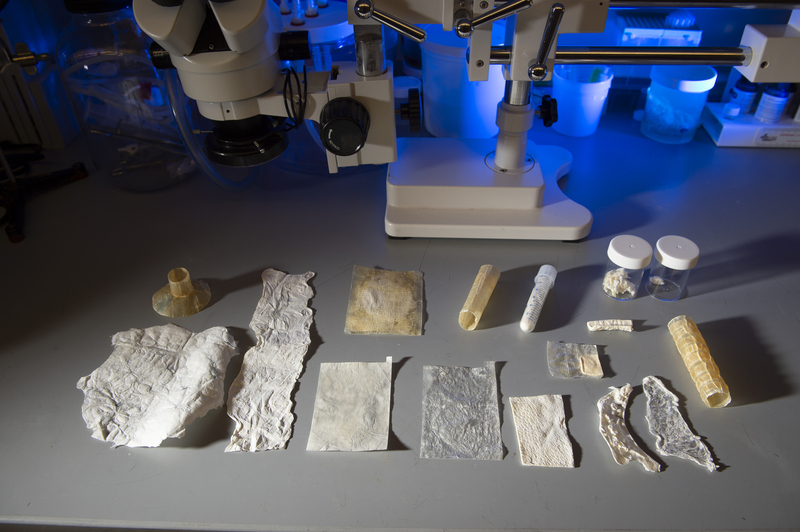 Badylak has not stopped thinking about tissues, becoming a world-renown expert in the development of extracellular matrix therapies which involve the use of biologic scaffold materials in tissue engineering and regenerative medicine applications. In his prolific 15 years at Pitt he ranks among the University’s all-time leaders in terms of invention disclosures filed, patents issued and technologies licensed. Earlier this year, taking advantage of revised Pitt policy allowing faculty to take on larger roles in startups, Badylak became chief scientific officer of ECM Therapeutics, a new Pittsburgh-based startup company that has licensed a patent portfolio from Badylak’s lab and is seeking to commercialize those discoveries across a broad range of therapeutic targets. For his dedication to achieving impact through commercialization, Badylak has been selected as the 2018 recipient of the Marlin Mickle Outstanding Innovator Award from the Innovation Institute. “Stephen Badylak and the Innovation Institute have grown up together and in many ways his lab has evolved the blueprint for successful innovation in the way that it balances the pursuit of basic science and commercial translation with the twin goals of discovery and impact,” said Innovation Institute Director Evan Facher. Badylak hadn’t begun to contemplate academic entrepreneurship when he joined the biomedical engineering center at Purdue University as part of a team exploring how to create new blood vessels using the lining of the intestines. A student on the team said that his father, who was a senior partner in a law firm, felt that the lab should patent the discovery. “I thought to myself, how do you patent an intestine?” Badylak said. But he followed the advice and filed for what would be the first of more than 60 patents that bear his name, and counting. At the time, the Bayh-Dole Act of 1980, which laid out the ground rules for university technology transfer, was still in its infancy, and most universities had yet to build out technology transfer departments. Badylak is a pioneer in the field of extracellular matrixes, biological scaffolds used to regenerate different body tissues. For the next 15 years at Purdue, Badylak said he and a chemistry professor who was charged with running the university’s initial technology transfer office, would work out license agreements with industry partners. “I really started to understand how important it was for university-based faculty to work with industry if they ever really wanted to commercialize their discoveries. I wanted to treat patients with the things we were discovering and the only way we we’re going to do that was by working with industry,” he said. A dispute over patent rights for Badylak’s discoveries erupted between Purdue and one of its licensees, in addition to a startup formed by a Harvard colleague of Dr. Badylak. The altercation resulted in Badylak’s termination. He was eventually vindicated in court in the dispute. He was not out of work for long as he was recruited in 2003 to Pitt’s McGowan Institute for Regenerative Medicine by then director Alan Russell. During the interview process, Badylak said, one of the people he wanted to speak with was the head of the technology management office, the predecessor to today’s Innovation Institute. He developed a friendship with Marc Malandro, who would become a decade later the founding director of the Innovation Institute before departing last year to help lead the science division of the Chan Zuckerberg Initiative. “Marc knew the direction he wanted to take the University as it pertained to technology transfer, and he brought in some talented people that are keeping things headed in a good direction,” Badylak said. He credited the Innovation Institute with embedding a licensing manager, Alex Ducruet, now the director of licensing and intellectual property, at McGowan. He said this brought consistency to the commercialization process. He said Malandro also advocated for building corporate partnerships at a time when they were often looked down upon. Today, he said, industry partnerships cover about half the costs of his lab allowing him to vigorously pursue basic and translational activities simultaneously. “If we’re working with you and it’s our idea and we come up with it, it’s ours. If we do it together, it’s shared. If it’s their idea and all we’re doing is following instructions and doing a study, they own it,” he said of the agreement. He said all commercialization efforts work best when the lab keeps meticulous documentation of its activities, which also helps when it comes time to draft patent claims. William Wagner, Director of the McGowan Institute, said Badylak’s lab has been a fertile training ground for students, who have gone on to successful careers both in academia and industry. “Steve really epitomizes what we’re all about. He is the father of an entire bio-materials field and has a great relationship with industry because he understands their goals,” Wagner said. Badylak says Pitt, under Chancellor Gallagher’s leadership, is evolving into a national leader in innovation commercialization. He points to a re-imagining of the University’s conflict of interest policies and through the expanded educational, funding and mentoring resources offered through the Innovation Institute and the wider University innovation ecosystem. “So, in the past five or six years, all of the support mechanisms that have sprung up … the PInCh (Pitt Innovation Challenge) program and the entrepreneurs in residence, and the startup funds. None of that was available, so if you are a faculty member you should be taking advantage of these things,” he said. Although Badylak has been successful in licensing discoveries from his lab over the years, he said it had been done in a piecemeal approach that may have scared away potential licensees who might be concerned about infringing related patents. So he decided to bundle a group of issued patents and current patents in prosecution and form a startup around them called ECM Therapeutics. “The University has an equity position in the company, so now it’s a win-win. Now there’s a proactive strategy on how to develop different applications of the same basic technology. As a quick example, my laboratory is interested in problems where there’s either no solution for or poor solutions … serious problems like esophageal cancer. We think we have a solution for that, so that is the first product that the company’s developing,” he said. The company hired Paul Fagan, former CEO of Pittsburgh-based Three Rivers Pharmaceuticals, to serve as CEO. “The progress that’s been made in four months is just absolutely remarkable. The company has rented space and is building it out. It’s going to be part of economic development in the greater Pittsburgh area. We’re creating jobs, and best of all for us is we’re moving rapidly get our science into the hands of the appropriate people so that patients can benefit,” Badylak said.